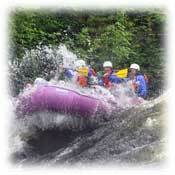 Maine White Water Rafting & Youth Goup Maine Adventure Vacations! If you're a girl scout, boy scout, or part of any type of youth group, you are cordially invited to enjoy White Water Rafting in Maine with Maine Whitewater! Not only do we offer the finest Whitewater Rafting on the Kennebec, Dead and Penobscot Rivers, we also offer incredibly low rates. For example, you can take your scout, or youth group down the Kennebec River for only $79 per person (minimum age 8), Penobscot River for only $79 per person (minimum age 10), and the Dead River for only $79 per person (minimum age 12 for high water releases and 10 for moderate summer releases)! In addition, PAY FOR 15 PERSONS AND THE 16TH GUEST IS FREE! This applies to camping, rafting, lodging, and meals for Kennebec and Dead River trips. There is no better Whitewater Rafting value in Maine! All river equipment is included for Scout, Youth and College groups. This includes paddles, wetsuits, spray jackets, Certified Maine Guides in every boat, a riverside lunch, and transportation to and from the river. You even get to see a digital slide show of your trip. If your scouts, youth group or collge group needs accommodations, we've got that covered too. We offer a wide range of camping and lodging packages (check out our lodging packages page to see them all). If your group is running the Kennebec or Dead River, ask about our Special Meal Packages, designed specifically for youth groups. Contact Maine Whitewater toll free (in the US and Canada) at 800-345-6246, or email us at info@mainewhitewater.com. You can also click here to request a current Maine Whitewater Rafting Brochure sent to you! NOTE: The document above is in Adobe Acrobat "PDF" format, and requires Adobe's free Acrobat Reader plugin (level 5.0 or higher). Also, depending upon your Internet connection speed, this document can take from a few seconds to a minute or so to download. If you don't already have an Adobe Reader 5.x plugin, click the Adobe's yellow icon below to find and download the correct version for your operating system.